Iain M. Banks, author of the 'Culture' science-fiction novels (among them, Player of Games, Use of Weapons, and Consider Phlebas) and, as 'Iain Banks', many 'mainstream' novels (including The Wasp Factory and Complicity), has passed away. He recently had been diagnosed with cancer (mentioned here in April). This link provides a nice overview of some of the themes of Banks's Culture novels. EDIT 2: I just realised that I had misspelt 'Iain' in this post and my earlier one. After 20 years of reading his novels, I still make this mistake. As someone whose own name is misspelt regularly, I should know better! EDIT 3: Economist Paul Krugman also is a fan. EDIT 4: Charles Stross on Banks. Bryce Lynch reviews the first (and so far only) module for Crypts and Things, UK-S01: Blood of the Dragon, here. And speaking of Crypts and Things, Newt Newport has been posting about it weekly in his 'Fiendish Friday' column. 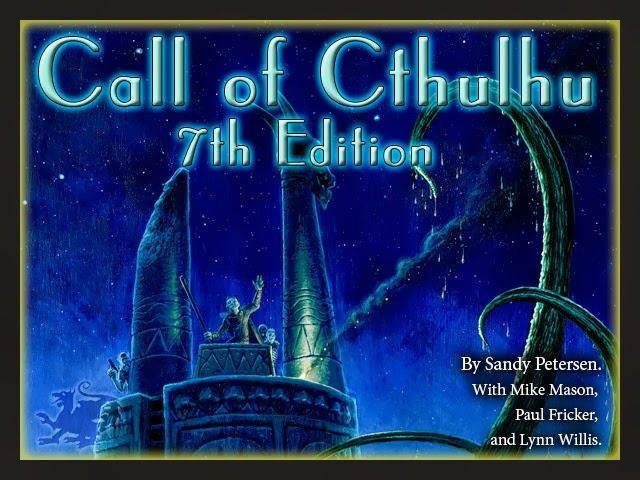 It seems that their kickstarter for their forthcoming revamp of The Horror on the Oriental Express was such a smashing success that Chaosium has decided to do one for their forthcoming new edition of The Call of Cthulhu RPG. It's important to note that the 7th Edition rules remain backwards compatible so that previously published scenarios and source books all remain playable with the revised rules. 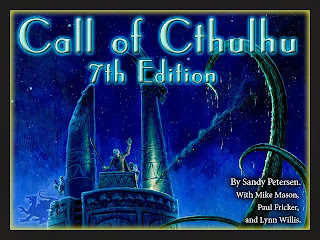 If this is indeed the case – and I certainly trust Chaosium that it is – then I don't mind the changes introduced in 7e. If I like them, then I can use all my old CoC books with 7e. And if I don't like them, then I can use any new 7e CoC material that catches my fancy with the pre-7e rules (viz. 5.6e/6e). I like that the Keeper’s Rulebook includes all the rules needed to play, but that an Invistigator Handbook will be available for players. The ‘pushing’ skill rolls mechanic sounds potentially quite cool. I’m pleased to learn that there will be two new adventures in the book (“Amidst the Ancient Trees,” and “The Crimson Letters”). Nice to see that some colour plates will be included in the Keeper’s Rulebook. As for the other changes, I have adopted a ‘wait-and-see’ attitude. But overall, I’m glad that 7e is not simply a tweaked and reformatted version of 6e, that they’re offering some new things, whilst retaining backwards compatibility. So, in short, I’m pretty excited about 7e CoC. Just call me a ‘slobbering shoggoth’!